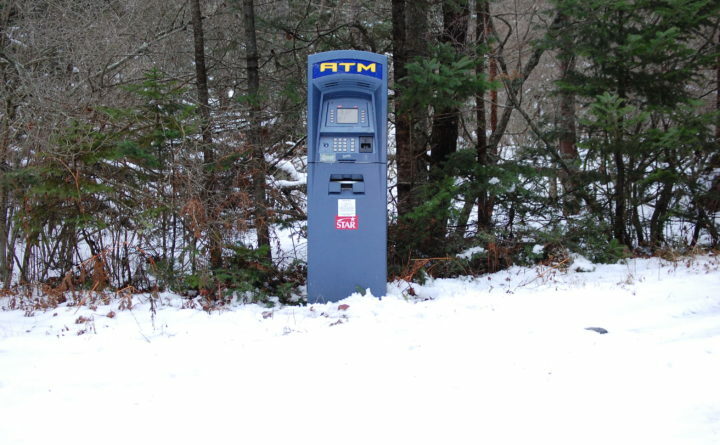 An ATM found in the woods of Deer Isle in November was put there as a prank. Sarah Doremus and Buzz Masters love a good laugh, but don’t call what they do practical jokes. Such jokes, they say, at least imply the infliction of embarrassment upon someone, and the two 60-something women don’t have that at all in mind whenever they unleash their particularly deadpan form of humorous creativity upon their neighbors of Deer Isle. Remember the broken ATM machine set up in the woods last month off Dexter Farm Road, in North Deer Isle? They say, and the Hancock County Sheriff’s Office confirms, that it is theirs — probably the strangest placement of an automated teller machine since the very first one was installed at a Barclays in North London in 1967. “It is almost like installation art,” Doremus said. The ATM was not the first item the two, who are artists who have been good friends for about four years now, have installed outdoors as an attempt at mirth. They say that they have nailed a medicine cabinet to a tree in some woods in Deer Isle — they refuse to say precisely where — with several items inside it, including bug spray, nail polish, a copy of the U.S. Constitution, lipstick and bandages. Most of the items they use come from the Deer Isle town dump. Doremus, Masters said, makes jewelry in which her humor is evident. One piece is a necklace with a mirror and a secret compartment behind it that holds a pair of tweezers. It’s called “Be Prepared — Whiskers Happen,” and it’s useful, Masters said. “If you are 60 like I am and find a whisker on your chin, you can pluck it,” Masters said. Another piece is a rosary made out of tin cans and cut up credit cards. “It’s about the anxiety that comes with being in debt,” Doremus said. A tourist walks up to three fishermen on a dock in Stonington. The guy explains that he has a sailboat out in the harbor and that his wife is aboard and kept their dingy with her. He points to a dingy on the dock and asks if they would let him borrow it. Sure, one fisherman says. Go ahead. The sailor thanks them profusely, jumps in the dingy and goes out to his boat. He conducts his business there smartly and is equally effusive with his thanks when he returns the dingy to shore. No problem, a fisherman answers. It’s not ours. And in keeping with local customs, the things the two place in the woods, in addition to being humorous, are solidly built – installed to last. The princess telephones that they’ve hung from some trees are so solidly installed that the trees could grow up right around them, they say. The ATM was actually in its third location when police discovered it last month, Doremus said. When they first got it from the dump, they put it in a friend’s driveway. It stayed there for several weeks before going inside another friend’s garage. Apparently their friends had a good idea of whom they were dealing with, Doremus said. They had placed the cash dispenser in woods near snowmobile and cross-country skiing trails, someplace they knew would be frequented by outdoorsy types. They had briefly considered placing it in a graveyard, but feared that might be offensive. That the sheriff’s office became involved, and moved so quickly to grab the ATM, was quite a shock to the ladies. They had hoped to drill a hole in a tree into which the machine’s power cord could run, they said, but hadn’t the chance to do it. That their joke was successful, and widely-known, dawned slowly on Masters. When she heard that police had grabbed the ATM, she said she apologized to the first person she spoke to at the sheriff’s office, likely a dispatcher, for having diverted a detective, Steve McFarland, from more important work. “They work hard, you know, so I felt really bad about it,” Masters said. Their elaborate humor has given rise to stories of other Deer Isle jokes, Doremus said. One involved an item taken from the dump and left among lobster traps. The lobsterman upon whom the joke was played must have wondered why the line he was pulling on felt so strange ― until it cleared the water and he found himself staring at a toilet bowl. Now that they have the ATM back, they expect the performance art will continue, although they are uncertain how the defunct machine will figure into it. One idea: to screw it into a rock outcrop along the coast of the island that does not go under with the tide. “A friend of ours is an engineer. He promised to make a motion detector solar light so that it can light up whenever anybody goes near it,” Doremus said. Or they might do something else. They won’t really know, they said, until the mischievous spirit is upon them.